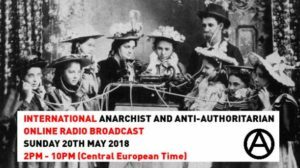 On Sunday 20th of May 2018 the participants of the Gathering of the International Anarchist and Anti-authoritarian Radio Network that is taking place in Berlin, Germany will do a live radio broadcast. The broadcast will cover wide range of topics from the perspective of anarchist and anti-authoritarian movements: presentations of local and international projects, groups/networks and activities/struggles; discussions on current issues; announcements of the upcoming protests/conferences/meetings/bookfairs; radical music and much more! Among the participants will be radio projects (radio stations, radio shows and podcasts) from all parts of Europe and the Americas participating (see the list of participants below) so interesting and politically up-to-date program is inevitable! The programme will be mostly in English. The programme will be broadcasted through online streams (see below) and some of the local radio stations will air it as well. …and we hope many more member radio projects that are unable to come will share their content in the show! This broadcast is one of the things organized by International Anarchist and Anti-athoritarian Radio Network that is being organized through International Meetings that take place once a year since 2015. First meeting (and radio programme from there) took place in Ljubljana, Slovenia in 2015, second meeting (and radio programme from there) took place in Berlin, Germany in 2016, third meeting (and radio programme from there) took place in Athens, Greece in 2017 and the fourth is going to take place again in Berlin. The multilingual network of anarchist and antiauthoritarian radios (shows, podcasts etc.) was established in order to strengthen the contacts among various collectives that actively work on producing audio materials with libertarian content. It presents a concrete method of exchange of radio materials, and establishing a platform of anarchist and antiauthoritarian radios, where you can search for the news, analyses, comments on important topics from different places across the globe. The material is produced by collectives, groups or individuals that share the antiauthoritarian or anarchist principles of organizing. The idea is not necessarily aimed at creating new radio content, but mostly to make available the content we already are creating. The network of A-radios was created through a collective process – among comrades, who feel strongly about libertarian content on the radio and who gathered on the International meetings of anarchist and antiauthoritarian radios with the aim to exchange ideas, practices or materials and to coordinate our common struggle for more autonomous media. You can check the programme and archive of the programme from 2015, 2016 and 2017 meetings!